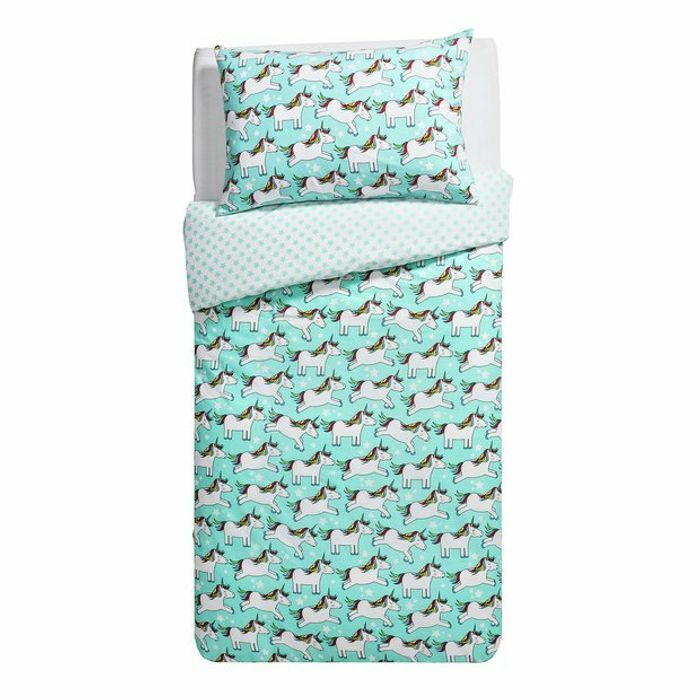 Add a dose of fun to their bed with this whimsical toddler bedding set from our Argos Home range. With a repeat unicorn design, this gorgeous and magical animal is looking sleepy himself. He has his eyes tightly shut so he's sure to encourage the little ones to drop off to the land of nod too! His gorgeous rainbow-coloured mane and tail add some fun colour to the blue background. For a completely different look, you can turn the duvet cover over for a starry night design that is perfect for creating a space for them to snooze. I once bought my son a pair of pyjamas and hid them away until he had grown enough for them. Ten years later I found them and sadly by then they were far too small! So sorry, that's disappointing for you. We can only try and post the deals & have no control over where they are available. Glad to hear that you have been able to benefit from this deal.